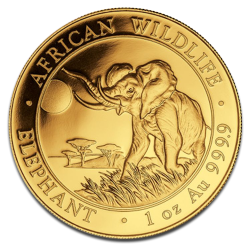 The Gold Somalian Elephant is one of the most successful bullion coins available today. It's prized by collectors for its beautiful design features and by investors for its high gold content. This impressive gold coin's unusual provenance also adds to its appeal. Although the coin bears the coat of arms of the Republic of Somalia, it is issued by the Bavarian State Mint in Germany. Furthermore, the Somalian Elephant replaces an almost identical coin that was produced by the mint between 1999 and 2003 with Zambia as the state of issue. Somalia Gold Elephants made their debut in 2008 following the success of Silver Somalian Elephant coins which began in 2004. Struck from .9999 fine gold, Somalian Elephant Coins are an excellent choice.